The UNESCO Cluster Office in Almaty continues to conduct, at annual basis, series of training workshops within the promotion of “Education for Peace” concept through the non- formal education. 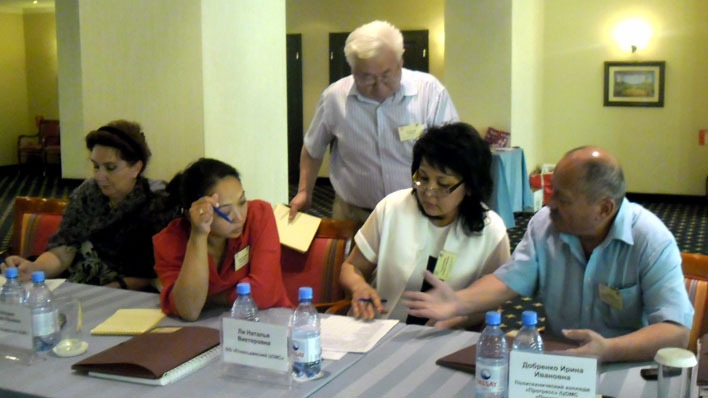 The scheduled workshop for CLC managers and focal points from Kazakhstan and Kyrgyzstan was devoted to the theme “Basics and working approaches for ensuring ethnic and confessional consent” and was held in Almaty from 15 to 16 June 2015. More than thirty participants: CLC managers and members from Almaty and Taraz cities, Almaty and Zhambyl provinces from Kazakhstan, and CLC managers and members from Talas, Naryn and Osh provinces from Kyrgyzstan attended the workshop. During two days the country participants discussed the issues of teaching-learning process and youth upbringing, development of skills to live together and ensuring ethnic and confessional consent. Within the workshop agenda the participants developed workplans for next information and training activities for the local population. The participants also focused attention on the leading role of CLC in promotion of non-formal education at local level. Use of interactive teaching methods allowed all participants to be involved in the training process. Interchange of theory with the practical work has enabled to keep interest and active atmosphere during the workshop. The trainers succeeded in development of creative and friendly working team atmosphere where participants could exchange wide experience, visions and plans. At the end of the workshop all participants have been provided with distribution materials and presentations that can be used in their work with colleagues, teachers and parents. According to many CLC members the workshop was organized timely, it was interesting, full of new information and had practical outcomes that would be helpful in their future work.